The Blackman's Brewery crew has never been shy when it comes to celebrating their surrounds and those around them. There's the beers named after family members, past releases tied to surfing competitions taking place just along the coast from their Torquay home and collaborations with local artists too. 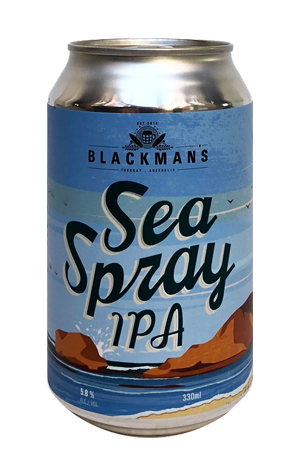 And, with this beer, they've gone and actually included some of their surrounds in the shape of seawater lugged from the nearby beaches and poured into an IPA. It's not the first time we've come across seawater being used in a beer – that's how the Freshie series of gose from Nomad started out – but it's certainly unusual to see it in an IPA (although, really, is anything unusual these days?). Aside from the foraged addition, the brewers opted for Simcoe and Loral hops, both varieties that can deliver a combo of fruity/piney characters and a more spicy/earthy underbelly. Thus, you'll pick up some pine and citrus on the nose, albeit sharing airtime with a distinctive salty, briny character. The salt and a little malty sweetness help round out the mouthfeel, while there's a nicely judged earthy bitterness wrapping things up in what, for all its quirks, is a pretty easy-going variation on a theme.